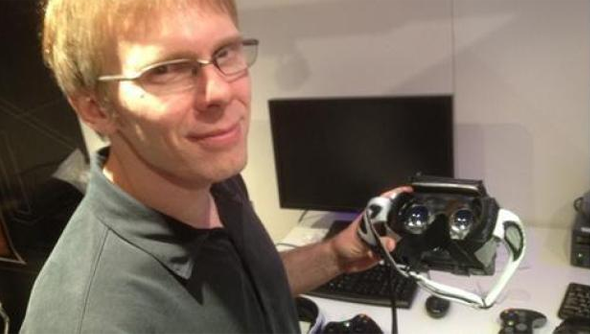 Ever the source of wisdom, John Carmack has been musing about the future of his adopted baby the Oculus Rift. As the project comes ever-closer to the promised ‘sooner rather than later’ retail release, Carmack has been thinking how the final product could be shaped. His projection: a stand-alone unit powered by an Android-running system on a chip. Talking to Engadget, Carmack said: “The way I believe it’s going to play out is you will eventually have a head-mounted display that probably runs Android, as a standalone system, that has a system-on-a-chip that’s basically like what you have in mobile phones.” He explained that in the modern tech environment developers need to look at providing something that has value on its own, rather than relying on something else. Of course, mobile technology is currently not powerful enough to run the likes of Battlefield in VR stereoscopic, and the Rift would be fitted with the ‘umbilical cord’ to connect to your PC for the full VR experience. But for those without super PC rigs, the Oculus can still function as a lower-end gaming headset, as well as a VR chatroom, without the need to be tethered to other devices. Launch shouldn’t be a million miles away now – next year is a frequently quoted time frame. But how the Oculus actually lands up in our hands is another question entirely. Within Oculus’ halls, several ideas are bouncing around, including retail launches through shops, direct-to-consumers from Oculus themselves, and ‘other options’, which could well be the ‘give it away for free’ approach as discussed last July.